ON MONDAY, FEBRUARY 13, 1905, eight- year-old Kenneth Beasley walked to the back of his school’s playground and into the melting snow of the woods beyond. He never returned. A massive search was undertaken for the North Carolina state senator’s son, and a reward was offered. Despite clues, rumors and even a ransom note, he was never found. A year and a half later, a political rival hurriedly was charged. Accused of the most bizarre and twisted of plots, he faced a courtroom overflowing with jurors, star lawyers, spectators and newspaper reporters. The eventual verdict and stunning aftermath would rip apart two families and shock a state ... yet leave a mystery unsolved. NOW CHARLES OLDHAM, attorney by trade, has reopened the case. Using modern research methods and his own legal training—while also investigating the state’s political, racial, lynching, and liquor cultures—Oldham has come as close as anyone can to the truth. The result is an absorbing, must-read story. Meticulously researched and beautifully written, The Senator’s Son is both an important book and a fascinating one. Charles Oldham is a native of Sanford, North Carolina, and has grown up with a love of everything about Tar Heel history. A graduate of Davidson College and the University of Georgia School of Law, he has been an attorney since 2000 and practiced criminal defense law for more than ten years. Charles now resides in Charlotte. FOR MORE: Please visit BeachGlassBooks.com. 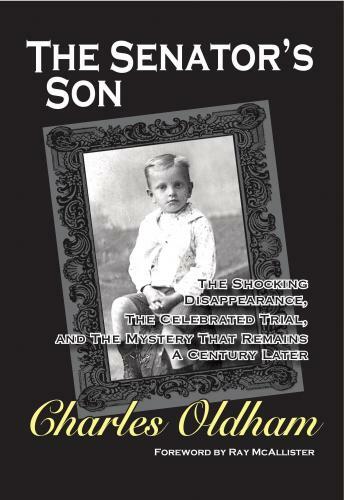 "In this thorough and deftly written historical who-done-it, Charles Oldham not only exposes a searing unsolved crime--or tragic accident--that caused a national sensation and devastated a coastal Carolina community but provides a fascinating window into the region's recent past and the murky politics and family alliances that defined it. The Senator's Son is local history at its finest. --DEAN KING, national best-selling author of "Skeletons on the Zahara" and "The Feud"
"Oldham warns us to step carefully when we stride backwards into coastal North Carolina and the turn of the last century, where shadows and perils abound. The Senator's Son moves with the grace of a serpent, the speed of a swan, it shifts and moves like a native beast in the glades, the way a great mystery ought. The book is craftily written, deeply researched, and will stick to your hands like a lantern during this dark, raveled Southern tale of disappearance." --DAVID L. ROBBINS, N.Y. Times best-selling author of "War of the Rats" and "The End of War"
One could not hope for a better exposé than The Senator's Son. Filled with passion, well-researched facts, maps, photographs and illustrations, with astute insights into state senators, financial influences, and special interests that led to disaster, the story is not just a historical recounting, but a vibrant, engrossing true tale that proves both educational and nearly impossible to stop reading.